You've heard me 1000 times complain about the worst part of making cookies is waiting for that darn butter come to room temperature. Seeing so many delish pumpkin cookie recipes in the food blogging world, I wanted to make them NOW. I go looking for recipes at night and get incredibly hungry: bad combo. Not wait for butter to come to room temp here on a cold fall day---will not happen. And, I do try the 'microwave till soft method', but I always end up melting half and the other half is hard--fabulous. I do not trust those microwaves at all. Call me old fashioned--hate using microwaves. 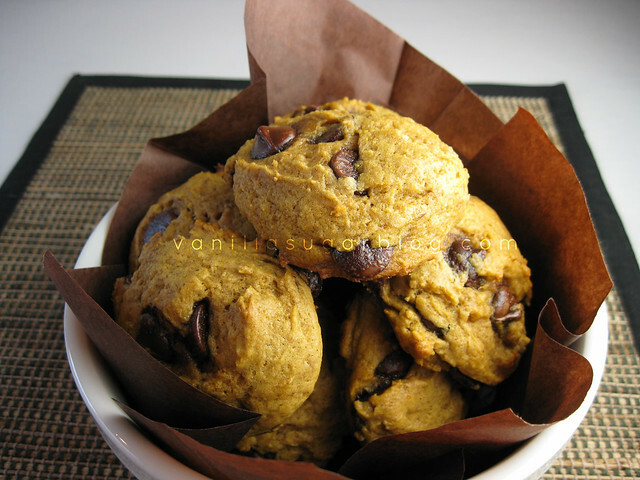 With these cookies, I used milk chocolate chips, but you could try semi-sweet. If I make them again, I will use salty pecans instead of chocolate--just been dying to try that. Also, I barely used any pumpkin pie spice, so only a few dashes in this recipe. If you want more then go right ahead. Do a quick taste-test of the batter to see if you like it. Use a small or medium ice cream scoop. This dough is very sticky. Mix the butter and all sugars together. I did this by hand; feel free to use a mixer. Add in the eggs 1 at a time, then the vanilla & pumpkin puree. Set aside. 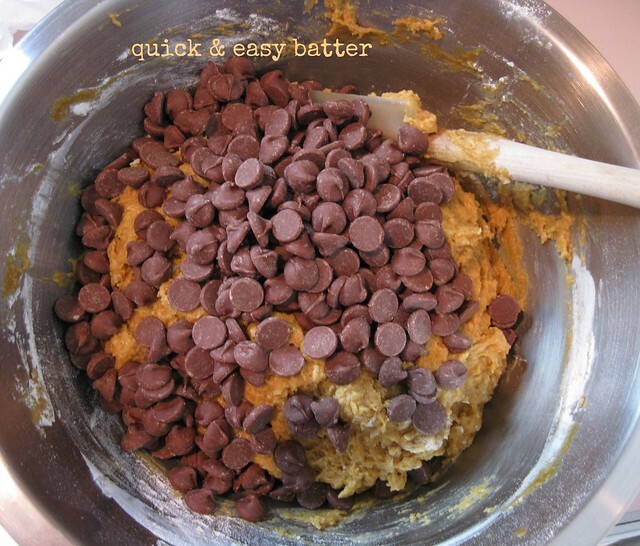 In a large bowl, whisk flour, baking soda, baking powder, salt, cinnamon, and pumpkin pie spice. Slowly add, in batches, the dry mixture to the wet mixture. Do not over mix! Lumps are good! Stir in the chips. Cover the bowl with plastic wrap and chill at least 2 hours or overnight. When ready to bake, preheat oven to 350 degrees, Line a couple cookie sheets with parchment paper or spray with nonstick cooking spray, or whichever method you like. 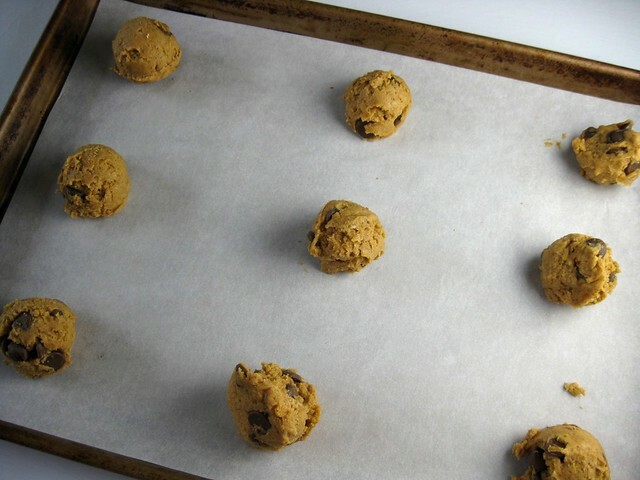 Using a medium or small ice cream scoop, scoop the cookie dough onto the prepared cookie sheets. Do no press them flat, leaven them round. Bake for 15 to 18 minutes, or until the cookies are browned around the edges. Let cookies cook on wire racks. Should make about 36 cookies if using a medium ice cream scoop, more if you use a small ice cream scoop. These look wonderful. Love your blog. A tip about softening butter: microwave 1 stick @ a time on high for 10 seconds. Works every time for me. No waiting. I know every microwave wattage is different, so you may have to adjust. Ok they look so good! About a month (or two!) 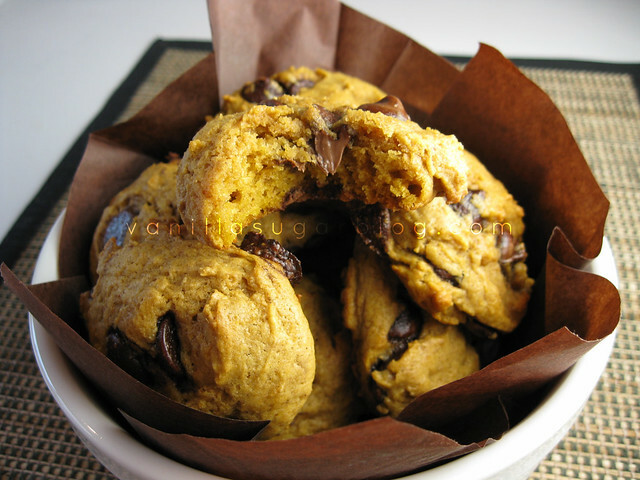 ago I made pumpkin choc chip cookies and had a time of it with getting the texure right so they weren't just cakey, but were chewy - and yours look perfect! And I think that anytime pumpkin is involved, "This dough is very sticky." They look fab! I too hate getting butter to room temp! And we don't use a microwave. I just pull it out of the fridge, chop into small pieces, and then it only takes a few minutes just sitting on the counter! 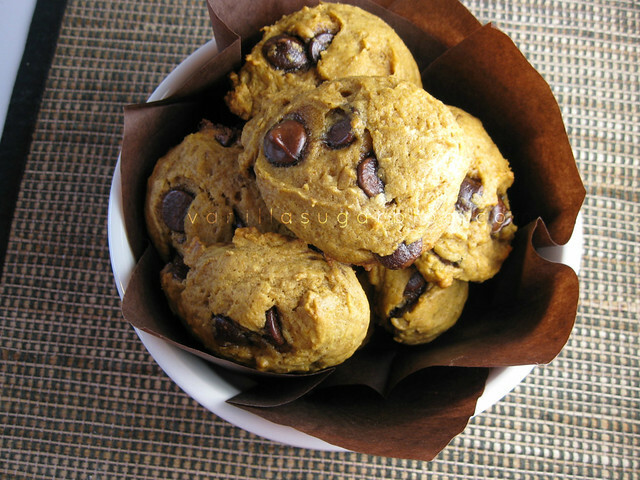 I just made similar cookies-so yummy!! They look just perfect. I am not a fan of microwaves either but can get the butter to soften pretty well in one in a pinch. Even worse than waiting for the butter to soften is waiting for the dough to chill. It looks like the end result is worth it though. Hey girl! I made cookies like these using oil instead of butter with similar results. I hear you on that not being able for butter to come to temp thing. These are swoonworthy. I especially love the salted pecan idea! yes, yes, i will be making these... with browned butter :) fabulous! !